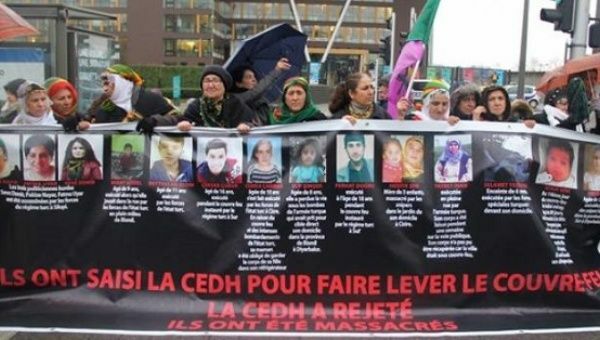 Activists say the court should be doing more to hold the Turkish government to account for killing at least 155 civilians in early February in the Kurdish town of Cizre. Turkey is a member of the European Council and is seeking to join the European Union, which ostensibly requires members to uphold human rights. Lawyers from the Diyarbakır Bar Association in Turkey filed applications with the European Court for Human Rights demanding the lifting of a curfew in Cizre, a Kurdish-majority city in Turkey's southeast. They also asked the court to support the opening of a human corridor to evacuate activists trapped in a basement in Cizre and provide medical attention to the wounded. The court refused to consider the application until all legal avenues were exhausted in Turkey. However, once Turkey's highest court rejected a request for medical treatment, the court still refused to consider the application. Lawyers have also launched an international campaign on February 24 addressed to the European Commission for the Prevention of Torture to condemn Turkey for its isolation of jailed Kurdish leader Abdullah Öcalan. The lawyers consider this a form of torture and a threat to peace.